Prickly and Bitter: A Frankenplant or the real thing? Those of you who have never seen this plant before probably looked at the leaves and thought "hey! I recognize those! That's an oak!" and then looked at the next two photos and thought "gee, she's awfully good at photoshop. Those leaves and flowers don't belong together!" Well, you would have been in good company in that boat of confusion; when I first saw this plant a couple of years ago I thought someone had created a Frankenplant by grafting two completely different species together (which is possible, but usually they're at least in the same or closely related families. 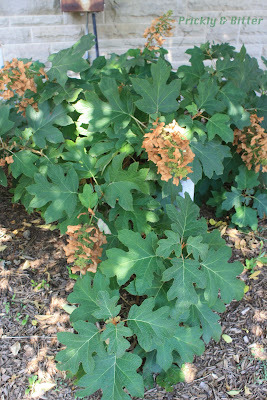 Hydrangeas and oaks are nothing alike, and don't share a recent ancestor). 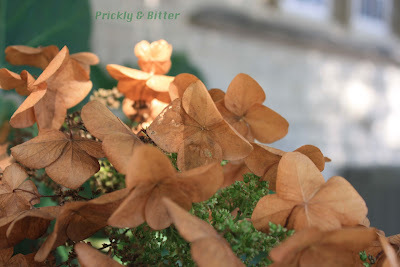 The oak-leaved hydrangea is a real plant, "created" as a product of evolution and natural selection, not garden novelty and artificial selection. It is native to North America as far north as Tennessee and as far south as Florida, from the eastern seaboard all the way west to about Louisiana. It can grow quite happily in southern Canada despite our cold winters as long as it is either drastically cut back in the spring to prune off all the dead growth (the winter will kill any overwintering buds; most of the new growth comes from the rootstock in Canada), or planting it in a very sheltered area from the harsh winds and the weight of the snow. Building a "burlap teepee" to put over the plant to protect it during the winter would be a good thing if you plan on keeping it around for a while; if not just a good hard prune in the spring and you'll be good to go. Just don't expect many flowers since those only grow off of at least one years' growth. 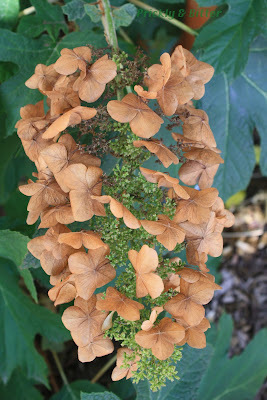 The oak-leaved hydrangea is a perfect example of phenotypic plasticity; that is, a plant's ability to modify its appearance based on environmental conditions. Often, this is a slow process involving changing growth patterns over weeks or even months, but in the oak-leaved hydrangea during peak growth times it can be in as little as hours. During times of drought, the plant actually has the ability to reabsorb nutrients from its flowers to put back into the leaves and sustain its basic life functions: making sugars from water and carbon dioxide, then breaking down that sugar again into energy. 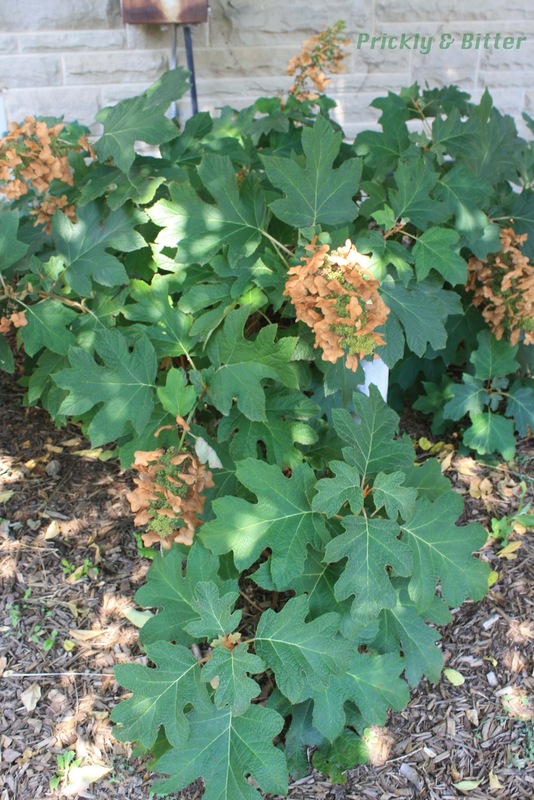 The flower buds will look completely healthy, but if the plant is experiencing a prolonged drought then all of a sudden it seems like the buds are withering and they turn brown. Those buds will never develop into flowers, but if you give the plant a good watering as soon as you notice it, new ones might form if you're lucky. 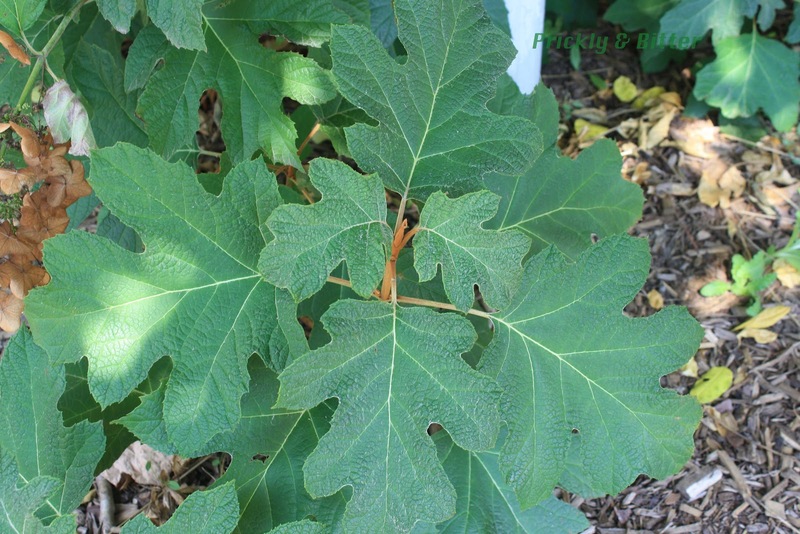 The plant can also modify the appearance of its leaves; after a prolonged drought the leaves will be more prominently lobed with less leaf area. If the growing conditions are ideal, then the leaves will be much fuller with more tissue between the main veins. You can almost think of it like the difference between a pin oak leaf (which you can see HERE) and a white oak leaf (which you can see HERE). A pretty drastic change!